The Wonder Woman movie is continuing to clean up at the box office, as its poised to become the summer's biggest film. And as audiences flock to see it multiple times, new details from the film are becoming more and more apparent. One fan theory was that the character of Chief, played by Eugene Brave Rock, was actually a demi-god himself, based on the conversation he had with Diana upon their meeting in the film. And now the actor has seemingly confirmed that fact; in an interview with Indian Country Today, via i09, Eugene Brave Rock says that his character is indeed a demi-god himself. In the film, when Gal Gadot's Diana and Chief first meet one another, they talked to each other in the Blackfoot language, a Native-American language spoken by about 8,000 people in northern Montana and southern Alberta, Canada. It was the only non-English language that wasn’t subtitled in the film, as if it was purposely left by director Patty Jenkins for dedicated fans to uncover. And it didn't take long, as certain viewers revealed that during their introductions, Chief introduced himself as Napi, a Blackfoot demi-god. Some fans thought this was just the Chief being clever, but no - on Twitter, Brave Rock said his reveal as Napi was an actual part of the script. So this is a pretty big deal, not just for his character, but for the overall DCEU. It means several things. For starters, it means that the Greek Gods are not the only "real" mythological deities in the DCEU. Just like in the comics, there are several pantheons out there. Second, it means that as a demi-god, Chief is ageless much like Diana, and could show up again in a future Wonder Woman film, or maybe another part of the DCEU. Third, it's possible he's an existing DC Comics superhero already. But which one?? The go to answer among fans seems to be Apache Chief. That character was created for the 1970s series Super Friends, and had the ability to grow to giant size. Two problems with this theory: first off, we never see a hint of that kind of power from Chief, even when Diana was flaunting her abilities. If he has powers, they are different than that. Second, and most importantly, Chief clearly says he's Blackfoot, not Apache. Different tribes, folks. So scratch that idea. We probably won't be seeing Eugene Brave Rock growing to Giant-Man size in a future Justice League movie. However, in the pages of the comics, over the years there have been several Native-American heroes (and one villain) who have gone by the name "Super Chief." 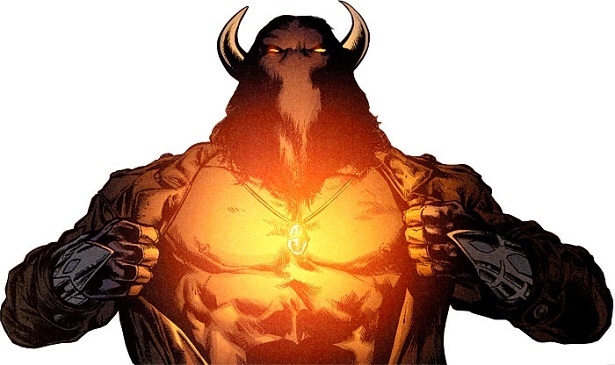 He has powers of great strength and speed, supposedly powered by an ancient amulet that fits around his neck. Now, this doesn't sound like Wonder Woman's Chief exactly, but they could take the name "Super Chief" and apply it to him for future installments. I could see it happening, since the creator of the last Super Chief was none other than Geoff Johns, current DC Comics CCO and writer of the Wonder Woman sequel. Stranger things have happened. Which Native-American hero from the pages of DC Comics would you like Eugene Brave Rock to play? Be sure to let us know down below in the comments.